We are big fans of breakfast in our house. Breakfast is something of an event at the weekends making up for the rushed mid-week days. We’ll usually have a few courses including smoothies and eggs or pancakes and enjoy our family time together. Luckily, we all love eggs. I’m always looking for new breakfast dishes to try and when I first heard of this Middle-Eastern dish, shakshuka, I knew I had to try it. I have put my own spin on it, I know that some purists would be horrified by my use of tinned tomatoes but this is just how we like it. I don’t use just any tinned tomatoes however. We buy our “Mutti” tinned tomatoes in our local Italian store as they are 100% tomatoes with a pinch of salt and nothing else. Even organic brands available in the supermarket often have sugar added so beware of this especially if you are following the Specific Carbohydrate Diet (SCD) like me. In fact, to be on the safe side, I always recommend contacting the manufacturer to ask if there is sugar added just in case. 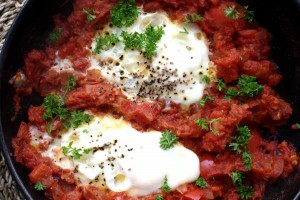 This shakshuka is a big hit in our house. It’s definitely a special occasion type breakfast and we usually reserve this one for birthdays, Christmas mornings or lazy Sundays. This recipe serves two but you can add another two eggs depending on hunger. 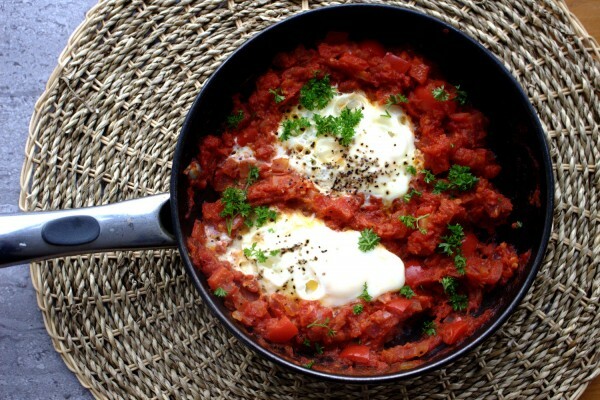 A delicious take on the classic middle-Eastern breakfast dish. 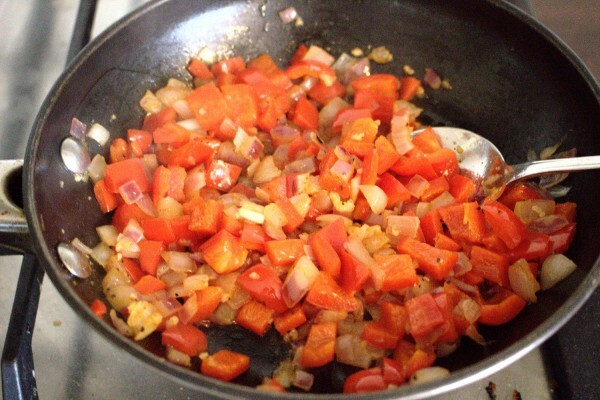 Add the olive oil to a small cast iron skillet/frying pan on a low-medium heat. Add the onions and garlic and cook for a few minutes until translucent. Add in the pepper and cook for a further few mins until they are begin to soften. Next add in a good pinch of paprika and cayenne pepper (careful this one is so spicy!) and season with sea salt and black pepper. 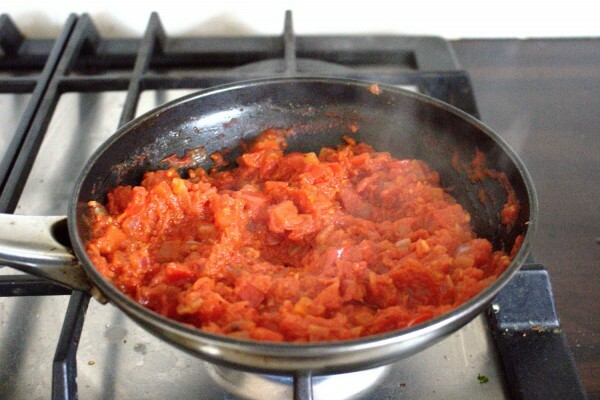 Add in the tinned tomatoes, bring the mixture to the boil then reduce the heat and simmer for 10-15 minutes until the sauce has reduced. Make sure to stir often to prevent sticking. By now the sauce should be quite thick and reduced. 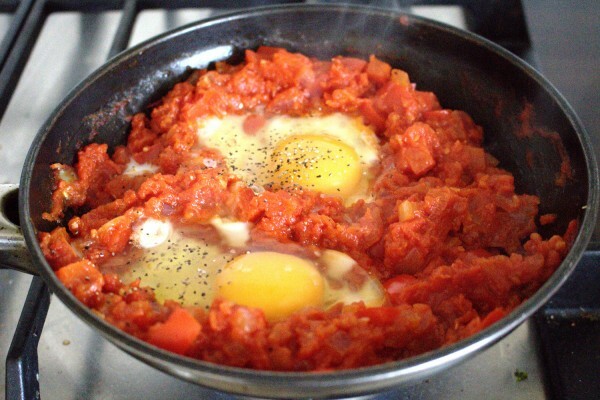 Crack the eggs first into a bowl/cup then making two holes in the sauce with a spoon, pour them in. Season the eggs lightly with some more sea salt and pepper then cover the pan with a lid and leave to cook on a low heat for 10 minutes until the eggs are cooked through. Serve with some chopped fresh parsley and enjoy!